Part of the Hare collection by Sophie Allport, this peg bag brings a homely touch to laundry day! 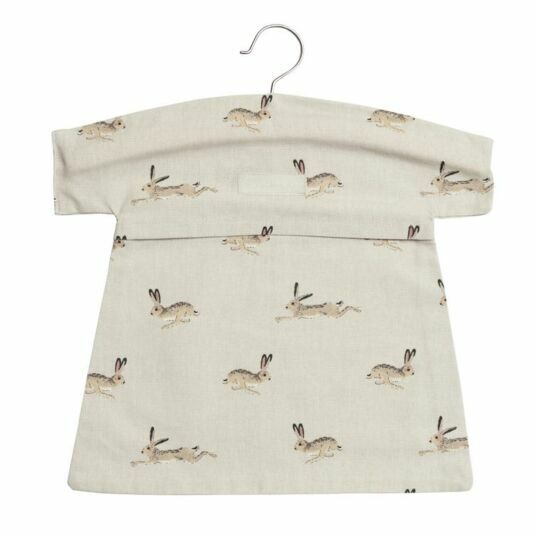 Made of 100% cotton, the peg bag has an integrated wooden hanger for hanging on the washing line and features a pattern of hares running and leaping on a stone coloured background. The peg hanger is the perfect accessory for the utility room, and would make a lovely home making gift. Holds approximately 40 pegs, hand wash only, do not tumble dry. For that extra special gift, add a matching item from the same range.